A black maxi dress and an Alexander McQueen double wrap skull bracelet is a wonderful pairing to add to your casual repertoire. Add a glam twist to your outfit with pink leather heeled sandals. If you're a fan of comfort dressing when it comes to your personal style, you'll love this uber cute combo of a light blue tweed jacket and a black leather bracelet. Dress up this look with black leather mules. If you're a fan of relaxed dressing when it comes to your personal style, you'll love this extra adorable combination of a red and navy plaid dress shirt and an Alexander McQueen double wrap skull bracelet from farfetch.com. Dress in a black cropped top and a black leather bracelet if you're on a mission for an outfit idea for when you want to look casually cool. When it comes to shoes, this ensemble pairs brilliantly with black leather flat sandals. Consider teaming a black floral bomber jacket with an Alexander McQueen double wrap skull bracelet for a casual-cool vibe. Rock a pair of black suede heeled sandals to kick things up to the next level. 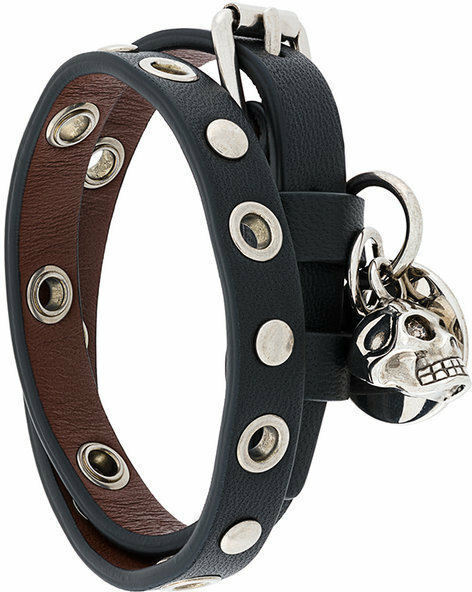 If you're all about comfort dressing when it comes to fashion, you'll love this absolutely chic pairing of a navy leather biker jacket and an Alexander McQueen double wrap skull bracelet. And if you want to instantly amp up the style of your look with one piece, enter silver leather pumps into the equation. 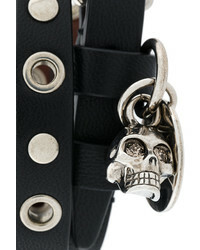 If you're obsessed with practicality dressing when it comes to your personal style, you'll love this chic pairing of a grey crew-neck t-shirt and an Alexander McQueen double wrap skull bracelet from farfetch.com. Black and white canvas high top sneakers are a smart choice to complement the look. If you're in search of a casual yet chic ensemble, consider teaming a blue tuxedo dress with an Alexander McQueen double wrap skull bracelet. Both items are totally comfy and will look fabulous paired together. Bring instant glamour to your getup with black leather pumps. If you're all about relaxed dressing when it comes to fashion, you'll love this super cute pairing of a charcoal tank and a black leather bracelet. Kick up the cool of your look by finishing off with tan suede heeled sandals.